In most areas of my life I don’t take good very care of myself. I don’t exercise enough; I eat too many sweets and not enough green vegetables; I don’t spend money on new clothes for myself because deep down I believe I don’t deserve nice things (that, coupled with the fact that I hate the way my body looks in a dressing room mirror.) I spend a lot of time primarily taking care of the people I love while neglecting my own needs or wants. Then I go and do something HUGE for myself: I agree to spend a couple of days in a rented beach house with ten of my best girlfriends whom I’ve known since our days together in junior high school. Somehow, against all odds, we’ve managed to remain close friends for almost forty years. Every so often we plan a getaway together without husbands or partners, without children or pets. Just us. 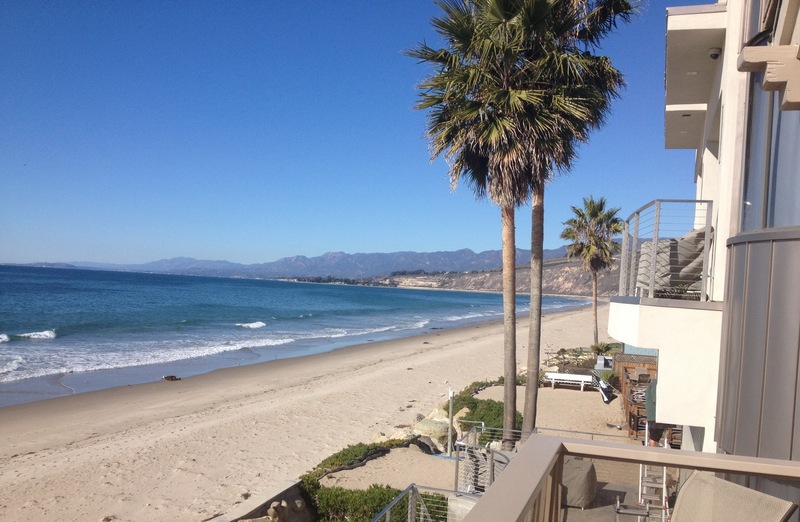 The beach house at Mussel Shoals was stunning—right on the water between Santa Barbara and Ventura with the most spectacular views of the ocean imaginable. Everyone brought a ton of food and we all pitched in together, cooking up gourmet meals and then cleaning up afterward. As the wine flowed and the coconut cake was passed around, we talked for hours and hours about our lives; our families, our joys and sorrows. We laughed—actually, we hooted, we guffawed—we pretty much shrieked like uninhibited second graders running around on the playground during recess. 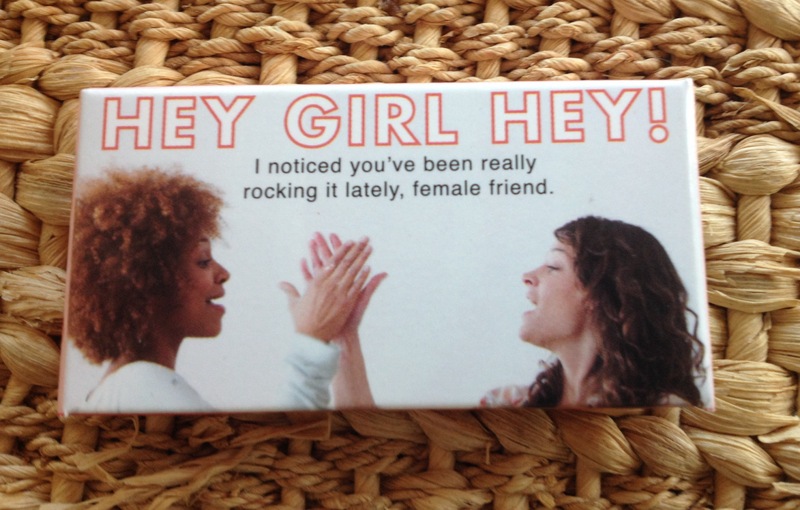 We were vulgar and crass and stayed up until two a.m. talking trash, (Hey, Girl, Hey!) laughing so hard our stomachs hurt the next morning—or maybe it was just the red wine and chocolate. 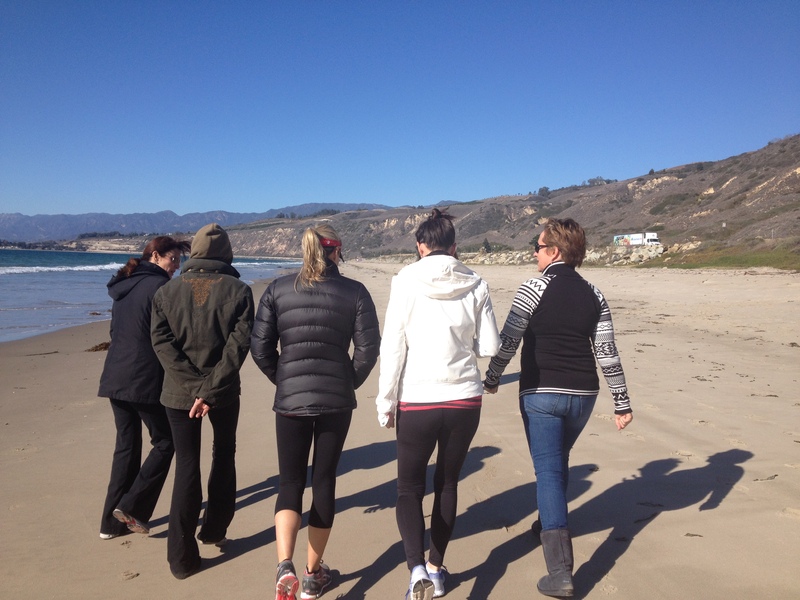 After a brunch which included juevos rancheros and mimosas, we took a long walk on the beach and with the cold December wind whipping at our faces we shared our stories with each other. Some of our tales were joyful, filled with newly found love or excitement over a new creative project in the works. Other stories were filled with sorrow and devastation. And then we cried. We cried because we were in a place where we felt safe to open up and reveal our pain to each other without judgment or criticism—a place where love, concern and support for each other decanted faster than the bottles of red wine on the kitchen counter. After spending only two days with these women, I became funnier, prettier, and more talented than I was when I first arrived. These women, who’ve only become more beautiful as they age, allowed my capacity for love to expand like a hot air balloon—and not just the love I feel for them, but more importantly, the love I feel for myself. They brought out my best—that special part inside of me that sometimes gets lost in the messiness of life. 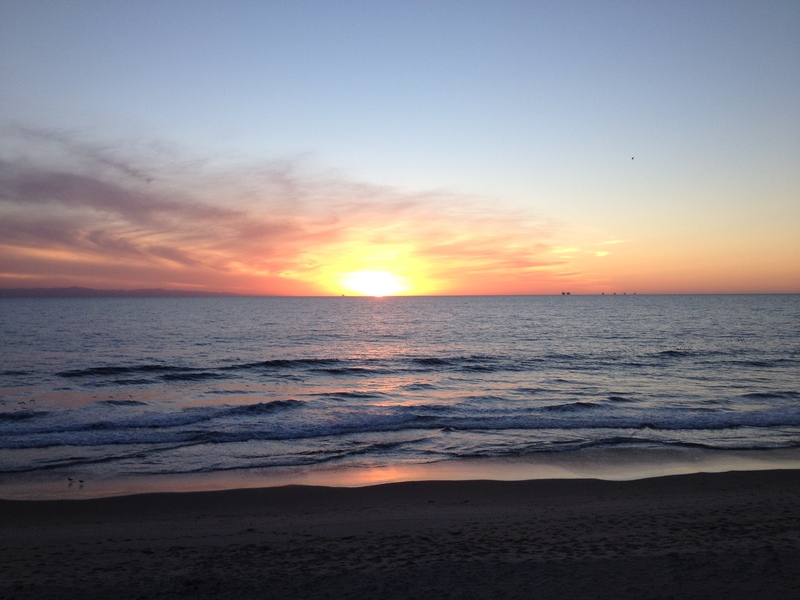 As I drove toward home, I felt lighter and more emotionally buoyant than I have in a very long time. I was full up again, satiated with the unconditional love and acceptance that these women offered up so freely to me. As I headed back to my ordinary life, I realized that what I had just experienced over the past two days was indeed extraordinary and I felt blessed. Off to my left, as the Pacific Ocean unfurled like a sparkling blue comforter laid down just for me, my spirit soared with gratitude. It used to be that I thought I never had enough. Now I know better. Today was just another day, but I’m able to walk through it and see how each moment is such a gift. I took these photographs to document that it’s the insignificant things in life that matter the most. These things make me happy. 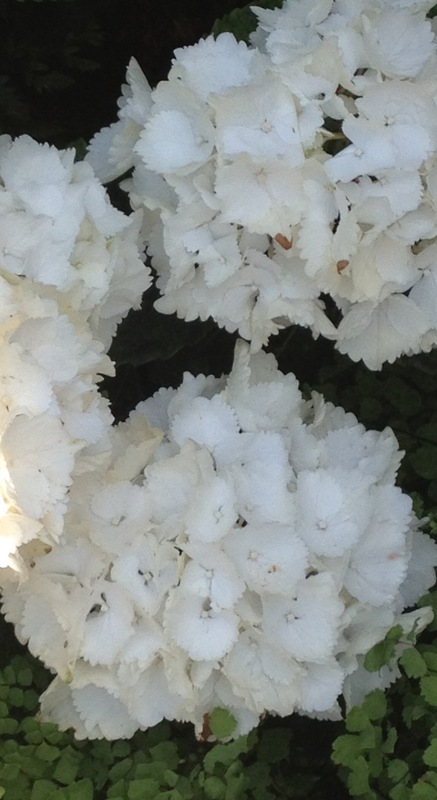 Billowing white hydrangea bushes blooming under my living room window like wedding bouquets. My lovely daughter, Isa who had her last day of second grade today. 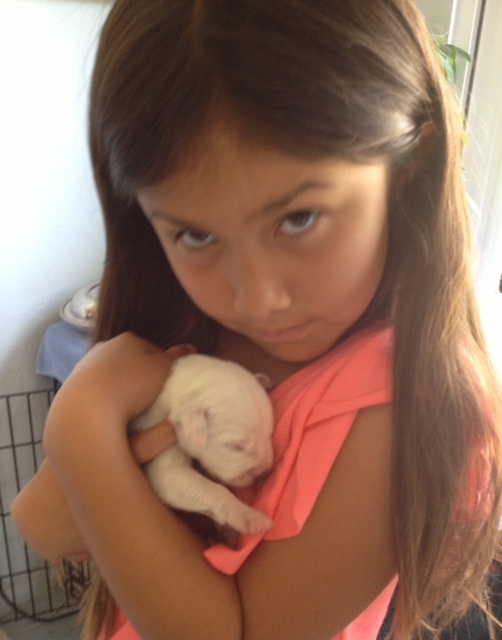 Here she is holding one of twelve puppies born only a week ago. A month ago, I cut this vine back so severely that I thought I had killed it. I was wrong. Every day it climbs a little higher up the fence. 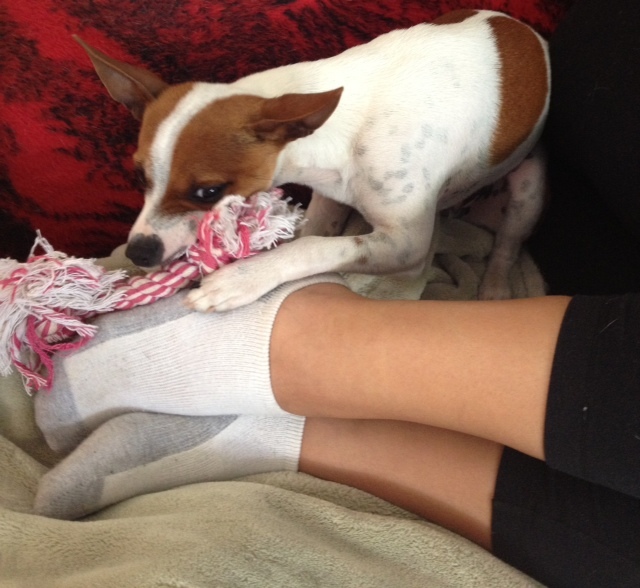 The newest love of my life, Cody–the Jack Russell/Chihuahua mix that my husband brought home without my permission. I was livid. For one day. Then I fell in love. Here he is, cuddling at the feet of my daughter, Nora who stopped by the house to take a nap before work. 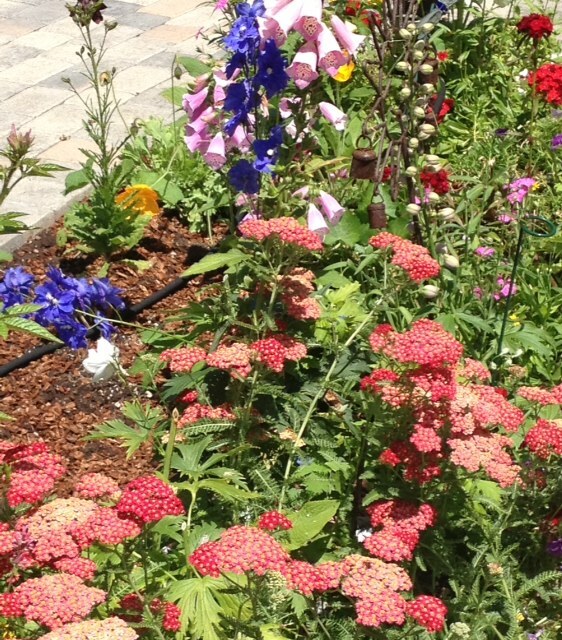 I’m always inspired by what goes on in the garden. Such color! 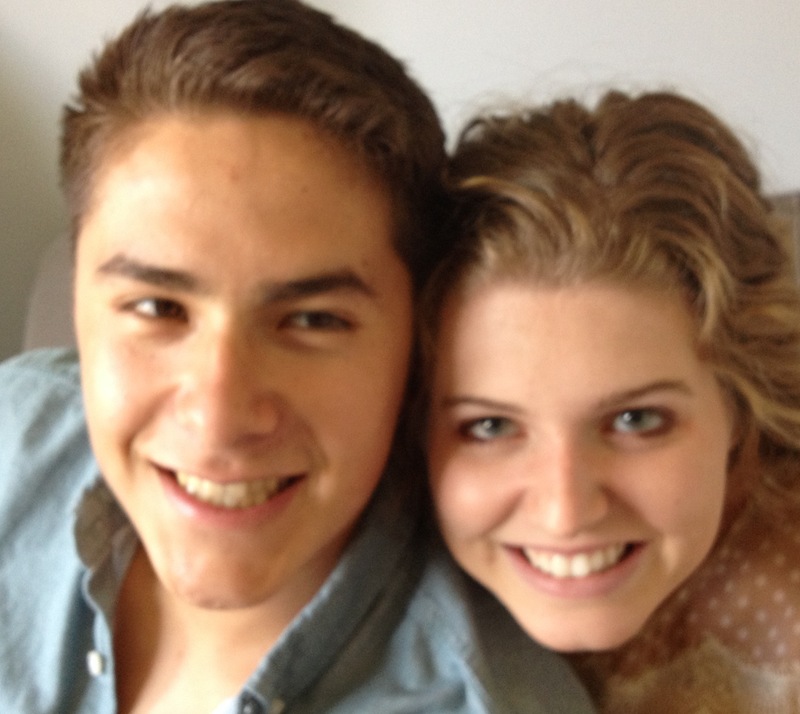 My wonderful son, Nino and his lovely girlfriend, Kristen. He’s a remarkable young man, although I think there’s something wrong with him because he still likes to hang out with his ridiculous parents. This is how great he is: he goes to Starbucks to get me coffee and sometimes he even pays. 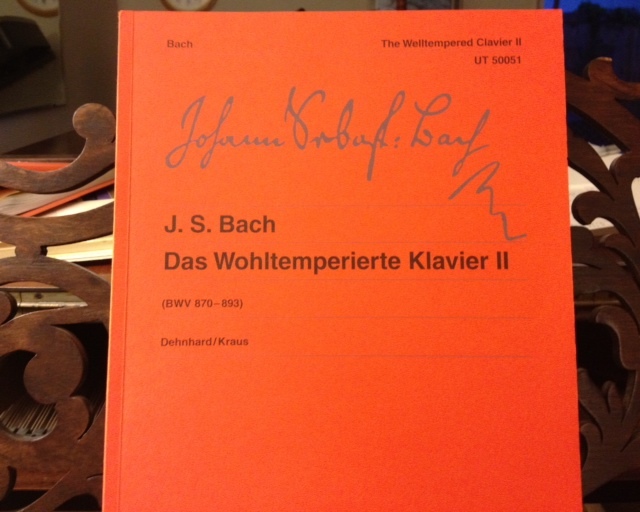 A surprise gift from a dear friend–and my absolute favorite composer, too! 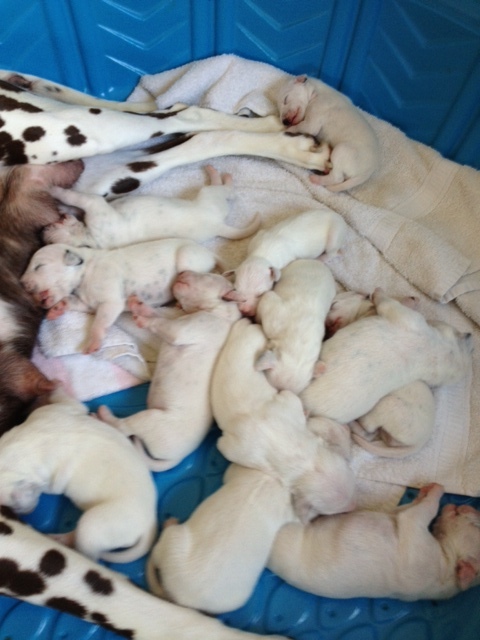 What is more precious than a pile of puppies? I’ll be away for a while, so I’ll leave you with my simple gifts in the hope that you can find yours…Happy Summer! If you’re in the neighborhood, come on over sometime for a puppy play date! This morning, I was pondering my life and thinking about what makes me feel most happy. I decided that quite possibly in a former existence, I spent many blissful years living in an old English Cottage surrounded by cool leafy trees, blooming flowers, and birds that sing all day long. I could have been Beatrix Potter, quietly spending my days writing and drawing while I sipped good English tea and nibbled on freshly buttered scones. 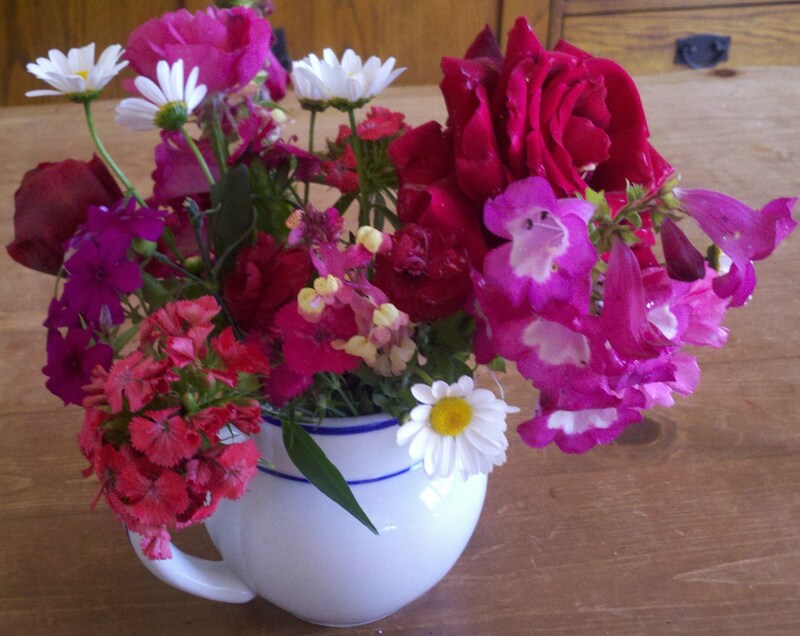 When I tired of my creative pursuits and needed to clear my mind, I would meander along the garden pathway and pick flowers for arranging around the cottage. A leisurely walk in the sunshine would undoubtedly clear my mind. 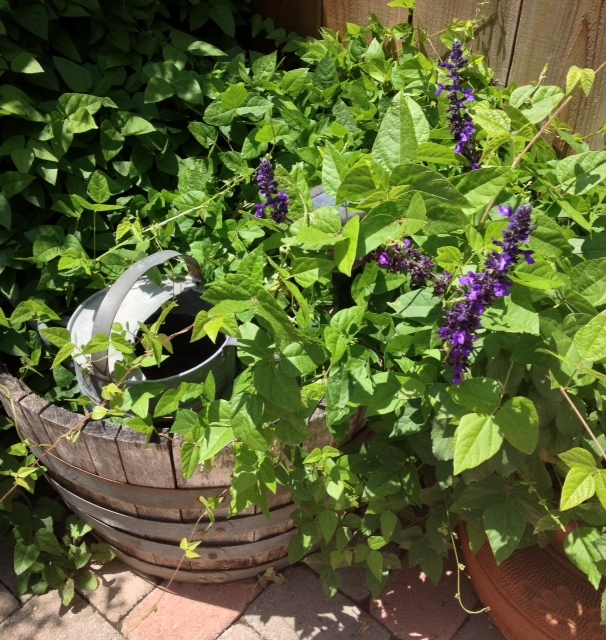 I figured this out as I puttered about my own tiny front yard garden this morning, staking up purple and pink larkspur plants that were so heavy with flowers that they threatened to topple over. 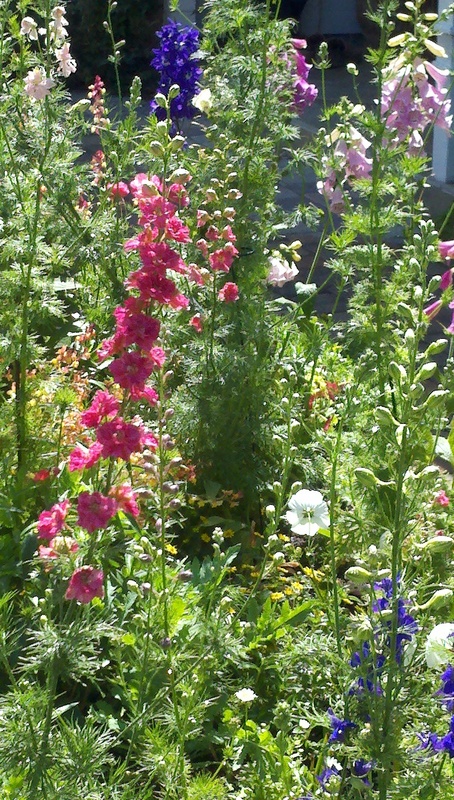 I picked up dainty foxglove blooms off the ground as the bees hummed busily beside me, probably annoyed that my presence blocked their easy access to the speckled blooms that still remained on the stalks. I listened as the Mockingbirds trilled their infinite repertoire of calls as if they were performing an outdoor concert just for me. 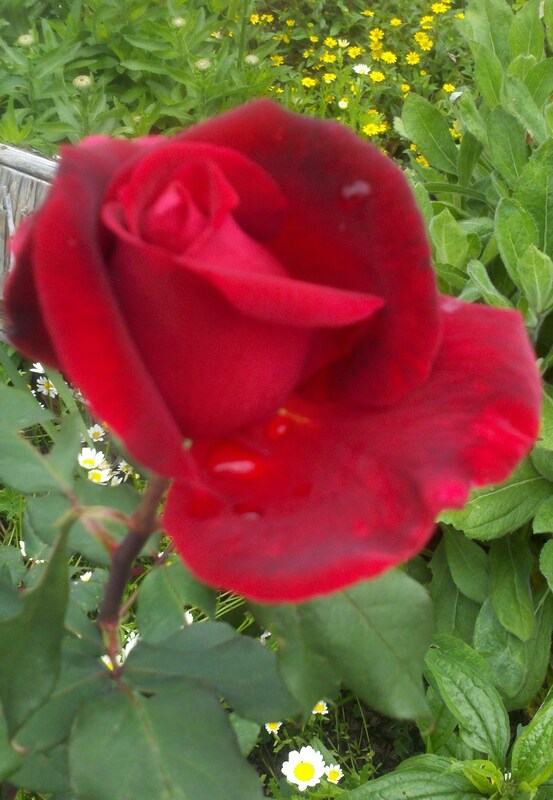 I practically swooned with pleasure when I stuck my nose into a newly opened rosebud, its deep burgundy petals softer than the skin on the back my young daughter’s neck. Most likely, my obsession with English cottages and gardens began when I was a young girl and I discovered that I could leave the stress and sadness of my own life and escape into a more peaceful one through the reading of books. 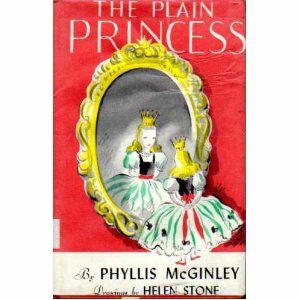 One of my absolute favorite stories was “The Plain Princess” by Phyllis McGinley—I must’ve read it over a hundred times. It’s about a young princess, so doted on and spoiled that her true beauty is hidden by her selfish and superior attitude. She is sent away to live in the modest cottage of Dame Goodwit, a woman who is thought to have magical powers, and if all goes right, will be able to transform Esmerelda into the beautiful princess she is meant to be. There, in that humble cottage, the four daughters of Dame Goodwit help Esmerelda understand that real beauty can never be found on the outside, but only through selfless acts of kindness and goodwill toward others, will it be able to shine forth from within. Because I never thought that I was beautiful, this message resonated deeply with me. I didn’t relate to the rich and entitled Esmerelda—living in a luxurious palace didn’t appeal to me at all. I wanted to be one of the Goodwit sisters who lived a simple life in a cozy, thatched-roof cottage with knotty pine floors and downy featherbeds. I wanted to sit and read surrounded by shelves stuffed full of books, a fire blazing in a stone fireplace while a spring thunderstorm raged outside. I imagined a hearty kitchen; a savory soup bubbling on the stove, fresh baked biscuits just out of the oven, while a streusel-topped apple pie cooled on the windowsill. 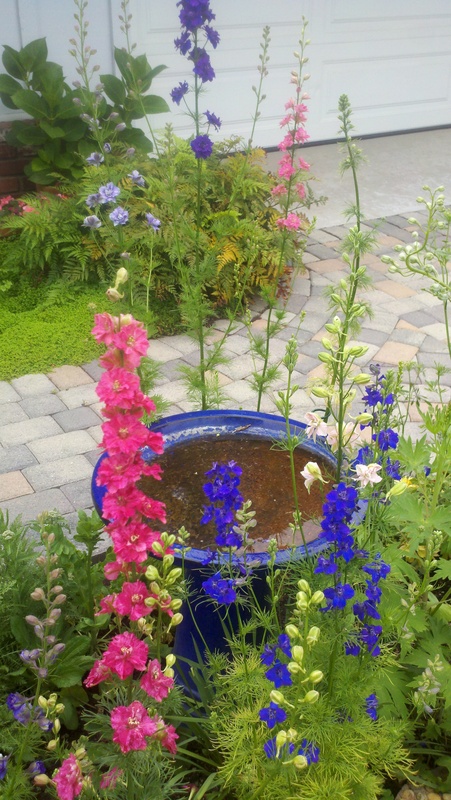 I truly believed that if I lived in a quaint cottage with a colorful garden filled with Hollyhocks and Delphinium and Larkspur, I could leave the sadness of my own childhood behind and find the safety and comfort that I craved. I eventually grew up and moved on with my life, going to college, getting married and raising four children, and I thought I had left my childhood fantasy of living in an English cottage far behind me. But just this morning, as I worked in the garden, I suddenly became conscious of the fact that I’ve created my own version of cottage life right here in my own home. On any given day, there’s a hearty soup simmering on the stove and freshly bakes scones cooling on the counter for my family to enjoy when they get home from school or work. I have time in the mornings before I start teaching my afternoon piano lessons to work on my writing. If I choose to, I can even sit by my fireplace with my nose in a novel. 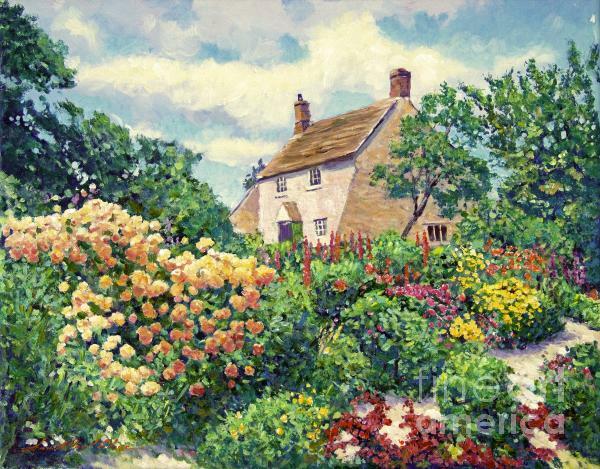 And most dear to my heart, I can putter about my flower garden, filled with the kinds of varieties that one would find growing in front of a quaint, country cottage in England. I have everything I ever dreamed of and never even realized it until right now. I guess you could say I live a storybook life—and I guess I’d have to agree with you.